the European rating list, Dinerchtein has better numbers in the Russian ratings and has a favorable score in their head-to-head matches. The two – who both teach online in the KGS Insei League — dominate the current Russian tournament scene, winning half the recent major titles. Shikshin won the showdown (see game record at right) with Dinerchtein at the Japanese Council Cup, sweeping the tournament 6-0, while Dinerchtein took second place. In third was Svetlana Shikshina 7d, who’s not been as active in tournaments recently, occupied with her 4-year-old son Slava. Oleg Mezhov 6d was fourth and Andrej Kashaev 5d fifth. Finns took three of the top five places in the B group, with Samuel Ritakallio 3d from Finland – a former student of Dinerchtein’s – in first place and Pekka Lajunen 2d in second, Dmitrij Kirakosjan 2d of Russia in third, Reino Karttunen 1d (Finland) in fourth and Sergej Vinokurov 1d (Russia) in fifth. “I have the feeling that Finnish 3-dans are able to fight on even with our local 5-dan players,” Dinerchtein tells the E-Journal. Click here for full results in both the A Group and B Group. For top-board game records, check JPNConsul account on KGS. More than 120 young players turned out for the 15th annual Jujo Jiang Cup Youth Goe tournament last Sunday at the Chinese Culture Center in Sunnyvale, California. The players were all under the age of 21 and ranged in strength from 6 dan to 29 kyu. Zhirui Yang 6 dan, a visitor student from Jilin province, China, led the A division by winning all his games, while local player Aaron Ye 3 dan took 2nd, losing only to Yang. With a growing go population in the Bay Area, the event also drew local news media, including KTSF26, the World Journal, and SingTao Daily, for onsite reporting. 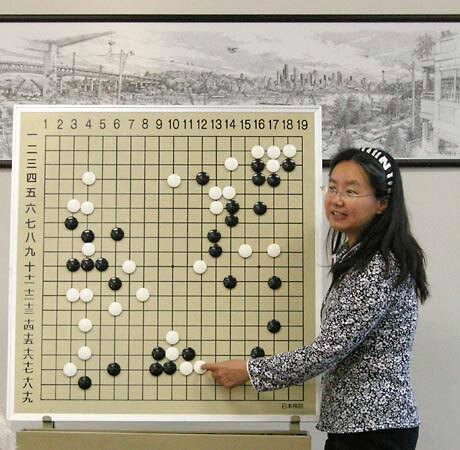 In the 19×19 division, players were divided into nine different groups from Group A (6-3 dan) to Group I (26 – 29 kyu) according to players’ strength. 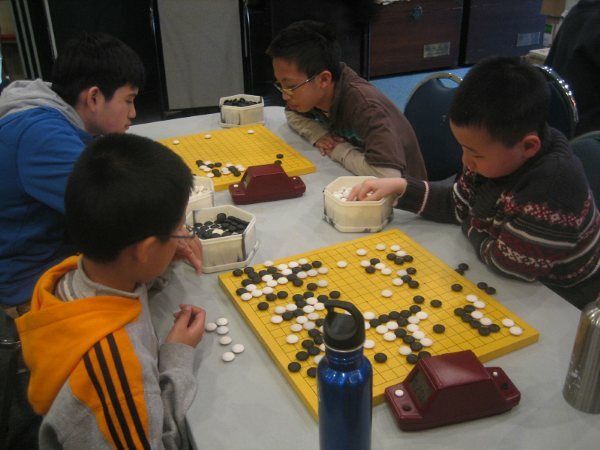 With the goal of prompting interest in go among little children, the tourney also had special 13 x13 board division which attracted 50 beginners around age of 5 or 6. Trophies were awarded to 1 to 4th place winners for each group and the first six winners of each group could choose their prize a selection of offerings. Winner’s Report: 19 x 19 Board: Group A (6D-3D): Zhirui Yang, Aaron Ye, Justin Shieh Group B (3D – 2D) Henry Zhang, Daniel Liu, Jeremy Chiu Group C (1D – 5k): Larry Qu, April Ye, Albert Chao Group D(6k-12k): Alan Hwang, Jonathan Ta, Peiken Tien Group E(13k – 16k): Patrick Wang, Eric Liu, Benson Lin Group F(17k-23k): Dyson Ye, Bryan Tan, Ryan Tang Group G(24k-25k): Allison Hwang, Jason Chu, Raymond Chen Group H(26k-29k): Jonathan Mi, Victor Chen, Samantha Meng Group I(26k-29k): David Huang, Jeffrey Mi, Brandan Chu 13 x 13 Board: first place winner for each group: Lilian Zhang, Timmy Chen, Felix Liu, Catherine Tan. Click here for complete results. “It is fortunate that Japanese people seem not to be inclined to show their stress and frustration in violent acts,” reports Michael Redmond 9P — who’s just been confirmed as a participating professional in this year’s U.S. Go Congress — from his home in Japan outside Tokyo. “Instead people did hit the stores with heavy shopping, stockpiling basic foods such as rice, milk, bottled water, etc. Most of these are back in the stores now, but water is still difficult to get. 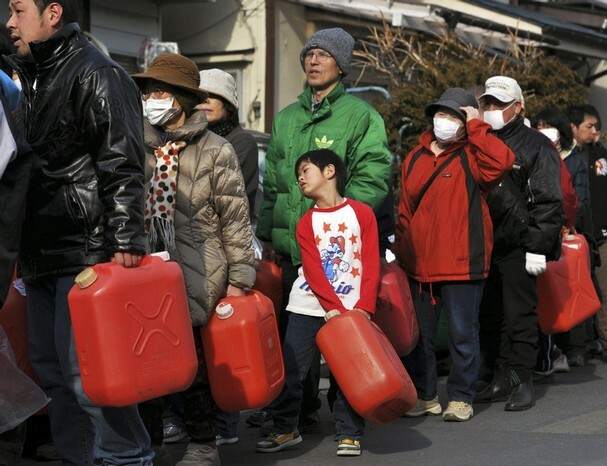 “After the quake there was a local gas shortage including the Kanto (Tokyo) area as well as the earthquake-damaged northeast. In the damaged areas the problem was compounded by difficulty in the logistics of getting it there. Since the victims in the disaster area need fuel to keep warm and to evacuate they will be helped first, and we will be waiting a bit longer for the gasoline to arrive. Apart from the logistics, the gas shortage is caused by the fact that some important gas depots/refineries were hit by the tsunamis that attacked the whole Pacific coast. The earthquake damage was not so bad actually, but the tsunami was off the expected scale and nothing could stop it. Gas stations in my area, which have been closed since the earthquake hit, re-opened last Sunday. They apparently are getting gas and other necessities to the disaster areas now also. Tokyo. The main inconvenience caused by the power cutoffs is that the trains are limited, in my case making travel to Tokyo less easy than usual. Iyama Yuta Evens the Judan. In the second round of the 49th Judan final on March 24, Iyama Yuta 9P tied the series 1-1 by defeating Cho U 9P by resignation. The third round will be played on April 7th. Park Yeonghun Takes Game 1 in Maxim Cup Final. In the first round of the 12th Maxim Cup final on March 21, Park Yeonghun 9P (l in photo) defeated Lee Changho 9P (r) by resignation. The Maxim Cup final is a best of three series and the second game will be played on April 7th. KINDLE GO? “Any plans for a game of go version for Kindle?” wonders Dave Gagne. “I have chess on my Kindle, but would really like to get a game of go. Have you heard anything?” Though there have definitely been go books published for the Kindle we haven’t yet heard of go playing software for the popular e-reader; email us at journal@usgo.org if you have. NO GO ALL AT ONCE: “Is there a way to download the Members Game Collections all at once or by month/quarter rather than one by one,” asks Larry. Sorry, Larry, but the game files must be downloaded one at a time from the annual collections of Member’s Edition material. Like the Capistrano swallows, Guo Juan 5P is returning to The Woodlands for another workshop Memorial Day weekend. Guo — a popular teacher and longtime E-Journal contributor — has held twelve workshops at The Woodlands in Round Top, New York over the last seven years. The workshop start with a lecture late on Friday evening May 27 and ends Monday, May 30 after lunch. The format is the typical workshop format with a mixture of lectures, games and game analysis. The Woodlands is an informal inn with over 20 bedrooms. Click here for details and to register. Takemasa Miyoshi 9k topped the 6-player field at the John Groesch Memorial held on Sunday, March 20 at the University of Maryland in College Park, MD. 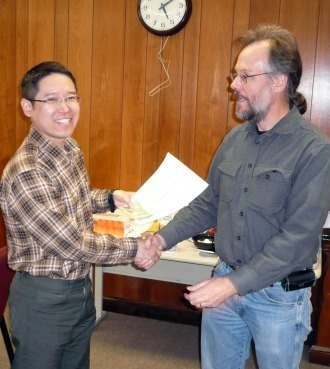 Takemasa (l), currently a Research Assistant Professor in the department of Atmospheric and Oceanic Science at UMD was undefeated in the three-round tournament. “The final game against Nate Eagle 10k was a nail-biter,” reports organizer Steve Mount (r), “which Takemasa won by a half-point.” Other two-game winners were Gurujeet Khalsa 9k and Zarathustra Goetzel 10k. The United States Youth Go Championships (USYGC) drew 58 kids and teens on March 26. Contestants vied for the top slot in five different sections. Dan level youth also competed for entry into a qualifier for the World Youth Go Championships, which will be held next week. Calvin Sun 7d again topped the Senior Dan Division, with a perfect record. Sun, who has represented the US four times in a row as USYGC champ, is required to take a year off from the WYGC, and will not be competing in the qualifier. The Ing Foundation, which sponsors the event, just changed the age limit to under 16 for the Senior Division. While this unfortunately disqualified several U.S. youth, the tourney allowed all of them to participate in the USYGC Qualifier anyway. Eligible finalists who will be advancing on for the right to represent the U.S. at the World Youth are Hugh Zhang 7d, Andrew Lu 6d, Vincent Zhuang 5d, and Yunxuan Li 2d (who pulled a surprise upset by defeating several four dans). In the Junior League (under 12) Aaron Ye 3d, Sammy Zhang 2d, Luke Zhang 1d, and Jeremy Chiu 1d will all compete in the finals next week. Both Senior and Junior division games will start at 9 am PT, Saturday the 2nd, in the AGA Tournaments room on KGS. Calvin Sun 7d is the National High Dan Champion, and Yunxuan Li now holds the title for National Low Dan Champion, Senior Division. The kyu level tourney was equally exciting, with kids ranked from 1k to 19k duking it out in multiple bands. April Ye 3k is the new Single Digit Kyu (SDK) Champion in the 1-4k bracket, Senior Division, while Larry Qu 4k is the new Junior Division Champ. In the 6-10 kyu bracket, top honors went to Joey Phoon 6k in the Senior, and Raymond Liu 10k in the Junior. Bennett Ji 11k won the Senior in the 11-19k bracket, and Julian Erville 11k won in the Junior. Winners will be receiving trophy plaques with their names and titles, $400 scholarships to the US Go Camp, and gift certificates for audio go lessons from Guo Juan’s Internet Go School. The USYGC was run by tournament directors Paul Barchilon and Jeff Shaevel. This week’s Member’s Edition content is being provided to all E-Journal readers as a sample of the great game commentaries and other special content provided each week to Member’s Edition subscribers. Please consider subscribing to the Member’s Edition today and ensure that you’re getting the latest and best content and supporting the world’s most widely-read English-language go publication. Click here for details and to subscribe today! Both players trade strategic and tactical errors in this game, which is thoroughly analyzed by regular E-Journal contributor Yuan Zhou 7d, one of the strongest players in the US. Yuan Zhou has won many titles; his most recent achievement was placing fifth in the Korea Prime Minister Cup–the highest finish ever for the USA representative. Zhou is also a popular teacher, lecturer, and author. He lives in Germantown, MD.